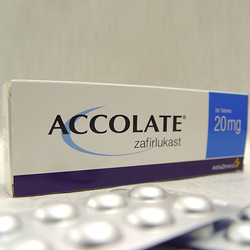 Zafirlukast is a type of medication which is useful in treating and prevention of asthmatic attack. Zafirlukast may potentiate the effects of other drugs due to its ability to inhibit hepatic cytochrome P - 450 which metabolize certain types of drugs. Zafirlukast may bind to the cysteinyl leukotriene -1 receptor in a reversible manner. Zafirlukast will block the binding of leukotrienes C4, D4 and E4. Leukotrienes C4, E4 and D4 will usually lead to an increase in the secretion of mucus and bronchoconstriction. Zafirlukast may lead to eosinophilic vasculitis, headache and abnormality of the liver function test.